I’ve been trying to sleep more, consistently, for the last few months. Initially this started as a fitness goal since everything I learn, states that recovery and sleep might be almost as important as the training and nutrition when it comes to gaining muscle, losing fat, etc. Is sleep getting in the way of your body composition goals? So I’ve been trying some of the suggestions in this article about hacking sleep. Over the last few months, I’ve increased my average sleep duration from under 6 hours to a little more than 7. I’d like to get closer to 8 blissful hours. I just feel better when I sleep more. But there are hints, that sleep might be even more important than these initial articles, and my own personal experience, suggest. Yesterday, John Berardi posted this comment to the Precision Nutrition Certification Students & Grads group on Facebook. 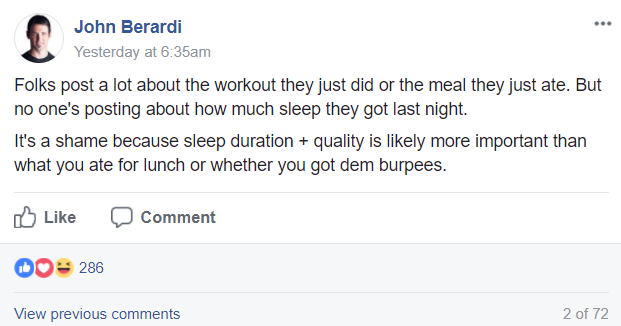 This aligns with a tantalizing post he made back in May 2017, about a research study in collaboration with UCLA on exercise, nutrition, and sleep. To summarize that longer post, sleep was the magic ingredient needed for dramatic body composition change. Hopefully the peer reviewed article will be published before the end of the year. But muscle gains and fat loss aside, sleep is also astoundingly important for behavior and brain development. I sometimes get research publication alerts on former colleagues. Jim Sutcliffe (we went to grad school together, same PhD advisor) recently co-authored a manuscript, Shorter sleep duration is associated with social impairment and comorbidities in ASD. ASD is Autism Spectrum Disorder. Decreases in sleep duration are associated with lower IQs, maladaptive behaviors, and reports of ADD, depressive disorder, and obsessive compulsive disorder in ASD. Regression results indicated that more severe social impairment, primarily a failure to develop peer relationships, is the core symptom most strongly associated with short sleep duration. In typically developing children, sleeping too little is associated with attention, behavior, and learning problems. Insufficient sleep is also associated with increased risk for depression, and in teenagers, increased risk of self-harm, suicidal thoughts, and suicide attempts (Paruthi et al., 2016). Notably, recent evidence suggests that sleep promotes normal brain development (Kayser, Yue, & Sehgal, 2014) and sleep disruption during development may affect adult brain connectivity (Billeh et al., 2016). This indicates that sufficient sleep is essential for normal neuronal development. Sleep deprivation has been observed to affect the neural circuitry underlying emotional regulation, including abnormal connectivity of the amygdala and prefrontal cortex (Maski & Kothare, 2013); this abnormal amygdala-prefrontal cortex connectivity has also been observed in ASD (Wiggins & Monk, 2013). I definitely need to prioritize sleep more.